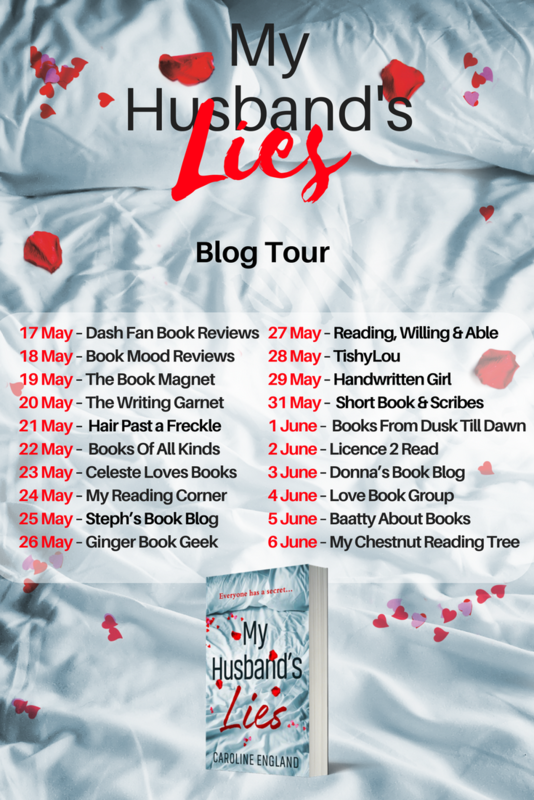 Welcome To My Stop on the Blog Tour For My Husband's Lies by Caroline England! I have a Q&A below with the lovely lady herself! Known since school as ‘The A Team,’ Nick, Dan, Jen and Will have been best friends for years. They’re just ordinary guys, aren’t they? Then why does Nick and Lisa’s wedding hurl their lives into chaos? Who is standing on the window ledge, threatening to jump? What deeply hidden family secret is exposed? Why does a sexual advance snowball? And which of them is telling lies? Why write crime fiction as opposed to other (genre) fiction? 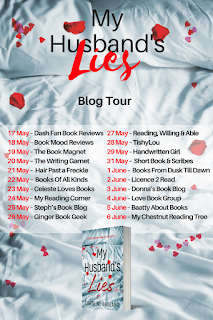 When I wrote My Husband’s Lies and Beneath the Skin, I simply penned stories I’d like to read myself about flawed but relatable characters who had deeply buried secrets, some of which happened to involve a crime! It turned out I was writing crime fiction. Very much at the psychological suspense or domestic noir end of the spectrum, but crime nonetheless! The best writing tips you were given. Just do it! The more you write, the more you oil the writing wheels. Also to allow your imagination to go to weird places. Nothing is off limits while you’re scribbling. You can clean up your mess later! It’s a very personal opinion, but I rail against anything prescriptive. I think the creative flow can be badly interrupted by some technical aspects of creative writing. If I was concentrating on the number of words to write per day and the structure of the novel, the five senses, the requisite amount of metaphors or similes as well as taking care to omit adverbs and adjectives, I’d never get the story written! Same as the above - clean up your mess later! The best about writing crime fiction. The best is creating my morally ambiguous cast of characters. I love to get under their skin and explore what their desires, needs, motivations and secrets are. Then I like to give them conflicts and put them in physical or emotional jeopardy. The worst about writing crime fiction. Fortunately my plots develop generically, so I don’t use spreadsheets to help with intricate plotting. I’m more a pantser than a plotter, thank goodness. Plotting out in advance would feel too much like being back at school! Readers saying that they guessed the twist from the start. Not that I can complain. I regularly annoy my family when we watch TV as I predict the killer or the shocking reveal by the end of episode one! Though in fairness I’m helped by which actors are cast. Notice a well-known actor in a seemingly tiny role? She or he has dunnit! I love all my characters (because I’m their mum) but I still feel a little offended when readers don’t like them! Of course they’re not meant to be likeable. They are meant to be imperfect, selfish, unfaithful or even down right evil, as that’s what makes them interesting. I love it when a reader cares for a morally ambiguous character, though. When that happens, I’m chuffed! What was the most helpful rejection letter you received? Five years or so ago, I submitted three of my novels to a small press. Although the editor rejected them, he was incredibly generous with his time and expertise by giving me detailed feedback on the opening chapters (out of the goodness of his heart!). Not only did I learn from him, he helped me believe that my writing and my stories were good enough to be published. It was a pleasure to mention him in the acknowledgments of Beneath the Skin. My Husband's Lies is out now! from Avon Books!